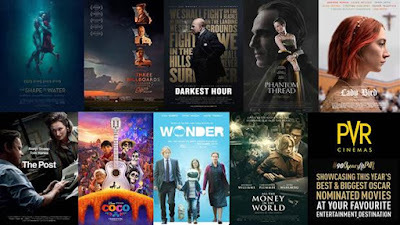 If you are a movie buff and have missed the movies nominated at the Academy Awards and you need a refresh before the most elite award ceremony, PVR Cinema has you covered with an exciting line-up of globally acclaimed & Oscar nominated movies at your nearest PVR Cinemas. Beginning from 23rd February till 1stMarch, PVR will screen the most revering films, which have made it to The Oscar’s red carpet.‘The Oscar Film Festival’ at PVR Cinemaswill showcase 9 Oscar nominated movies across 10 cities in India including Delhi, Mumbai, Bangalore, Pune, Hyderabad, Chandigarh, Kolkata, Ahmedabad, Baroda and Chennai. 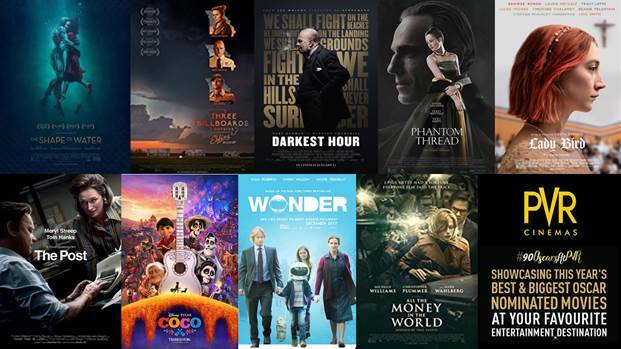 The movies to be screened during the PVR’s s Oscars Film Festival include Phantom Thread, Lady Bird, Darkest Hour, The Post, The Shape of Water, Three Billboards, All The Money in The World, Wonder and Coco.